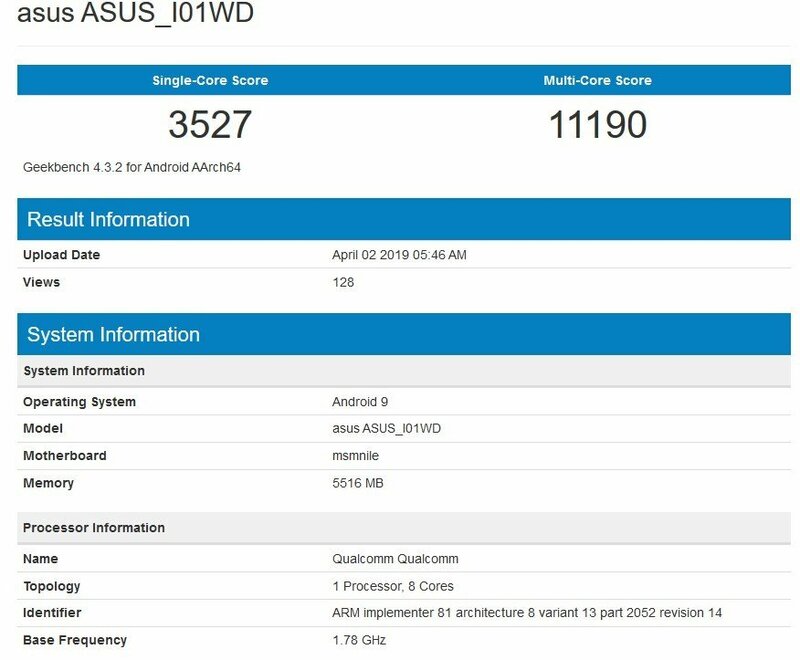 Asus Zenfone 6Z Antutu Benchmark details have surfaced on the web which confirms some of the basic hardware specifications of upcoming flagship device from Asus. As per Antutu Benchmark listing, Asus Zenfone 6z sports a Full HD+ display having a resolution of 2340 x 1080 pixels. The flagship is powered by Qualcomm Snapdragon 855 processor along with 6G of RAM. It comes with 128GB internal storage and runs on Android 9.0 (Pie) based operating system. Asus Zenfone 5z scores 363,172 on Antutu Benchmark, which is not an impressive score considering that it is powered by Snapdragon 855. This may be one of the early prototypes and the final version may offer better Antutu Benchmark score. An ASUS Zenfone 6Z benchmark has appeared on Geekbench, and it spills the beans on some of the device’s tech specs. The phone has the model number ASUS_I01WD and runs on Android 9 Pie. Though the phone isn’t mentioned by name, the score of the device’s benchmark is flagship worthy, which is why we think it could be the Zenfone 6Z. The Zenfone 6Z benchmark listing which popped up yesterday, shows that the device is powered by a Qualcomm Snapdragon 855 processor with 6GB of RAM. And now for the Zenfone 6Z benchmark score. The phone managed to score 3527 points in the single-core test, which is quite impressive and is only behind the Samsung Galaxy S10 phones with an Exynos processor. The Zenfone 6Z managed to clock 11190 in the multi-core test, which actually exceeds the Galaxy S10+ top score of 10674 points, in the Geekbench Android Benchmark charts. Remember the leaked invite for the launch event that ASUS has scheduled for May 16th? The press render teases a bezel-less phone, and clearly mentions the name “Zenfone 6”. So, it is possible that the Zenfone 6Z could be announced on stage during the event.